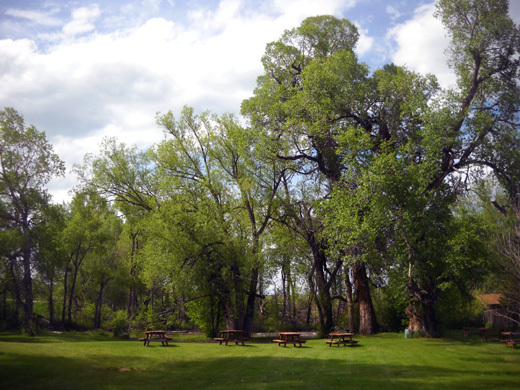 "As snowpack continues to melt throughout KOTA Territory, communities struggle to stay dry. 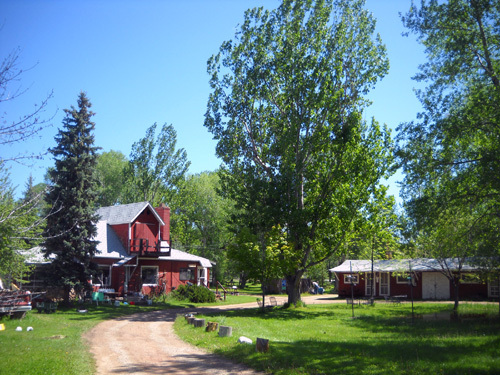 But for some living close to the Tongue River in Ranchester, Wyo., it's a battle they can't win." 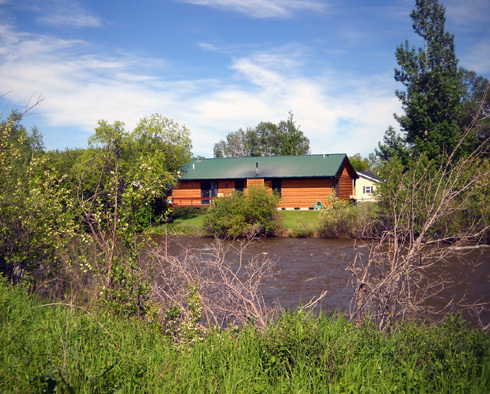 Ranchester is just a few miles downstream from Dayton, Wyoming, where we are now camped at the Foothills Campground -- only 300-400 feet away from the Tongue River! 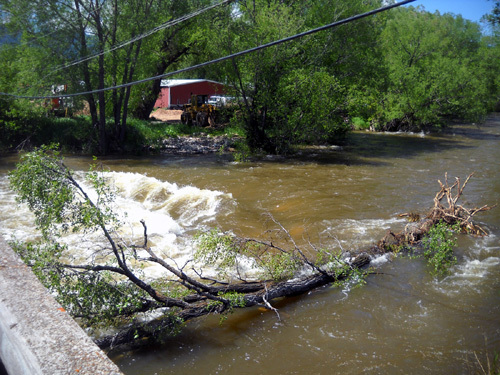 The river is high in both communities, and forecasters predict it will get higher and cause more flooding as rain continues to fall and the record-breaking snowpack in the Bighorn Range continues to melt. This is just the beginning of the misery that folks in low-lying areas along the river will probably experience; flooding is expected to continue for at least a week and maybe longer. Above and below: houses and businesses that might flood along the Tongue River in Dayton. The Foothills CG is to the left of the bridge below; you can't see it in this photo. 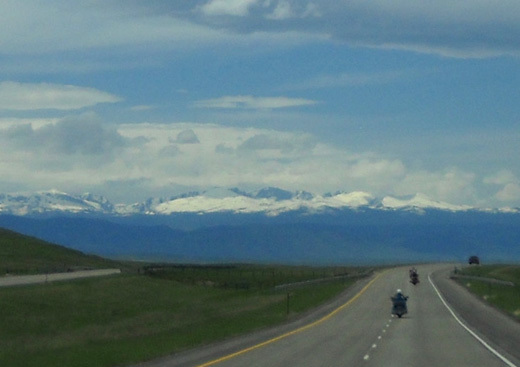 As you can see in the last entry, we did make the decision to travel to the Bighorns again, although for a shorter time than usual. Not only do we like participating in and volunteering for the Bighorn Mountain Wild & Scenic Trail Runs, we were also more than curious to see what the area looked like after all the snow and rain. 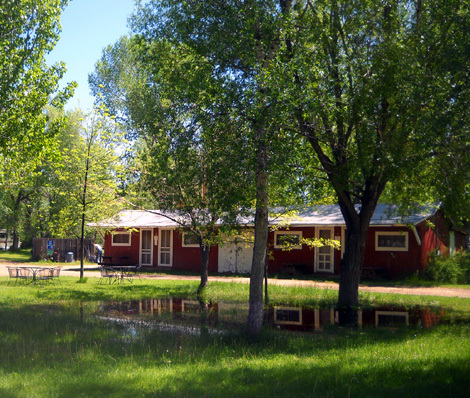 This entry shows photos from our RV trip to Dayton, WY, the Foothills Campground, Scott Park (where the Bighorn races end), and the flooded Tongue River. The next entry has pictures from our hike through the Tongue River Canyon, which is part of the race course. We had a leisurely morning at Ellsworth AFB yesterday, knowing we didn't have very far to drive to the Foothills Campground in Dayton, WY. We've been at this long enough that it doesn't take us very long to get ready to move from one place to another. 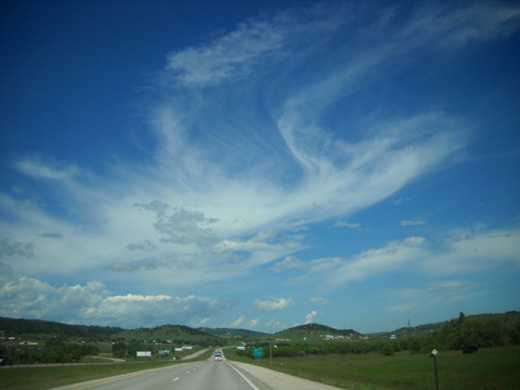 We left Rapid City a little after 10 AM. 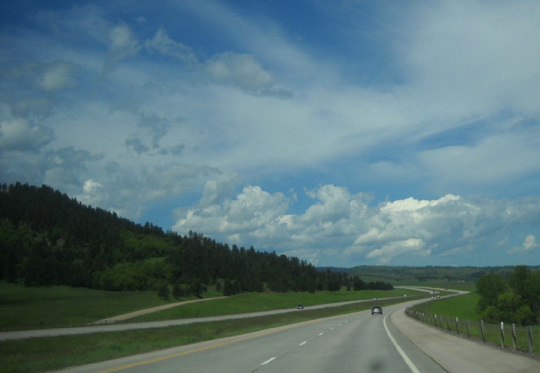 It was a beautiful day for a drive just north of the Black Hills, just south of Devil's Tower, and over to the Bighorn Mountains. Below the sky our world was a blur of bright green as we flew along on the freeway. I don't think we've ever seen the prairie grasses in South Dakota or the sage-covered rangeland in Wyoming so lush and green before. "Lush" and "Wyoming" aren't normally used in the same sentence. Most of the state is very dry and in recent years it has suffered droughts; tan and brown are the usual colors when the ground isn't covered in snow. This year has been exceptional with all the snow, then copious rain. The plants look downright lush. We saw standing water in fields, full streams, and overflowing ponds on the way to Dayton, but no obvious flooding along I-90. I'm anxious to go up to Burgess Junction to see the snow tomorrow. (You can bet there will be pictures.) 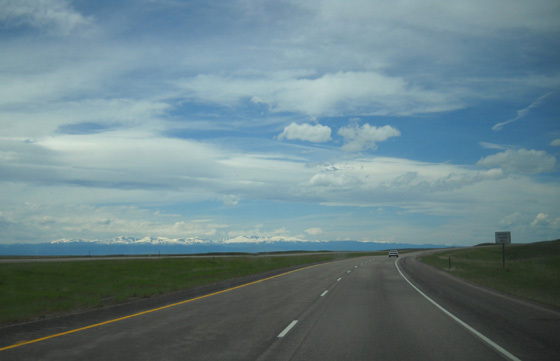 US 14A over the top of the Bighorns was just opened on June 9. I showed some photos in the last entry of WYDOT recently clearing the deep, deep snow. The trip to Dayton took us five hours with stops at two rest areas and an average speed of 60-62 MPH. Road conditions were good and traffic was generally light. We saw more RVs on I-90 than semis -- even on a weekday. It was nice to drive to Wyoming without being paranoid about our camper tires blowing out. This was our first ride on the new tires Jim installed on the Cameo while we were in Rapid City. He found the deal on Michelins at Sam's Club that he patiently waited several months for: $70 off four tires and no interest on Sam's credit card if paid within one year. We always pay our major credit card off each month; deals like this allow us to spread the payments out over several months on a second card and still pay no interest. We've done the same thing with our Home Depot card. The local store didn't have the tires we wanted but they arrived within a few days. Jim took the wheels to the store, gave them the old Duro tires that came with the camper to recycle, and had the new ones mounted on the wheels and balanced. He brought them back to the campsite and installed them himself. We've been worried about those cheap Duros since we bought the camper. Lots of Cameo and Carri-Lite owners on the two Carriage internet listserves we follow have written about the blowouts they've had, often causing thousands of dollars of damage to the body of the coach. Many of the respondents replaced their Duros -- either before or after they failed -- with Goodyears or Michelins. 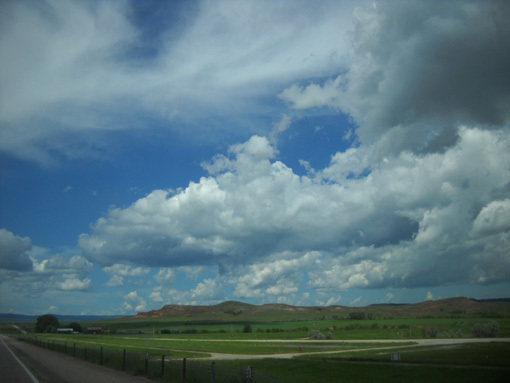 Along I-90 in Wyoming; we had a flat camper tire one year near Gillette on our way to the Bighorns. We had at least three memorable blowouts while driving our previous 5th-wheel camper, a HitchHiker, at freeway speeds. We were just short of paranoid about the Duros on the Cameo blowing out. Fortunately, ours did well until we replaced them. That's because Jim kept a close eye on them. We also watch our camper weight, keep our speed down, and use a tire pressure monitoring system. The Duros looked fine when we got rid of them. Maybe they would have lasted longer. We didn't want to bet our lives on it, however. When we arrived at the Foothills Campground in Dayton yesterday afternoon Marshall Hood and his wife Lea welcomed us with open arms. I would guess this is about the eighth time we've camped with them so they're like old friends. There isn't supposed to be a pond in the lawn! That's from recent heavy rain, not the river. Marshall directed us to a back-in site with full hookups that isn't as wet as the nearby pull-through site we had last year. 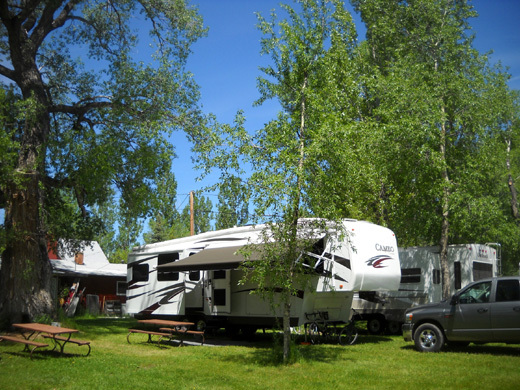 There are about twenty RV sites. Some have electricity, some just have picnic tables. Only four sites for short-term visitors have full hookups (water, electricity, and sewers); we always reserve one of those. There are additional sites with sewers around the perimeter of the property that are occupied primarily by folks on a seasonal or year-long basis. The weekly rate for sites with full hookups is $130 + $2/day for cable TV = $144 for seven days. That comes out to $20.57/day, which is inexpensive for a private campground. The weekly rate is the same as last year but the cable cost has increased by 50� a day. Jim says it's well worth it for all the TV stations he can access. Jim is able to connect to the free campground WiFi signal on his laptop but we can't get it to work on my computer. I can use our Verizon MiFi card, though. Our phone and MiFi signals are strong. In fact, our MiFi signal is stronger than the campground WiFi signal! Which reminds me of something I forgot to mention when we were at Ellsworth AFB recently. When we get online with either WiFi or MiFi we can see what other connections are nearby. Some are public, like the ones we sometimes find in campgrounds. However, most folks with their own private WiFi devices, such as our MiFi card, make sure they are security-enabled so others can't access their financial accounts or use up their time/capacity. Some of the private WiFi systems are just generic numbers but most have names chosen by their owners. We laughed when we saw one at Ellsworth called "MineNotYours." I love it! Another 5th-wheel came in right after us and is parked on our service side. An ultra running friend, Susan Gardner, arrived this afternoon with her FunFinder trailer; she is in the other side of us, facing our door side. We enjoyed spending time with her tonight. She'll be running the 100-miler. There are very few other short-term folks staying here at Foothills right now. 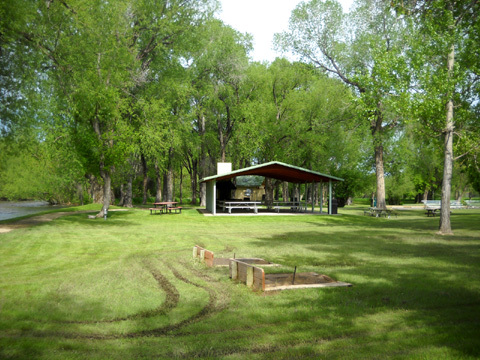 Most of the cabins, tent sites, and RV sites are empty. 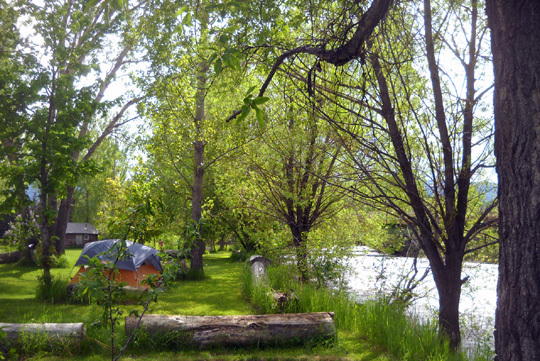 Risky business, camping so close to a river that reaches its high point during the night! 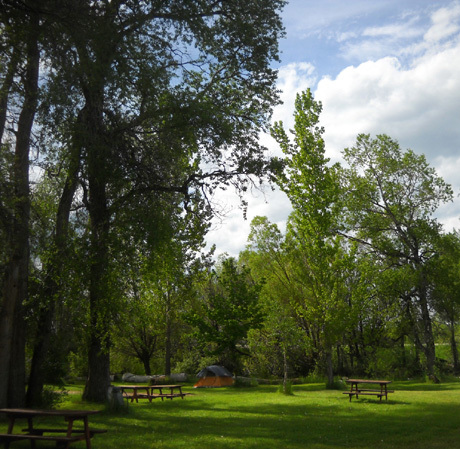 The campground will be full by Friday, however, so we're enjoying having the place pretty much to ourselves for a few days. The Tongue River, that is. Soon after we got set up yesterday I took Cody for a walk through the campground and adjacent Scott Park so I could see just how high the river is. 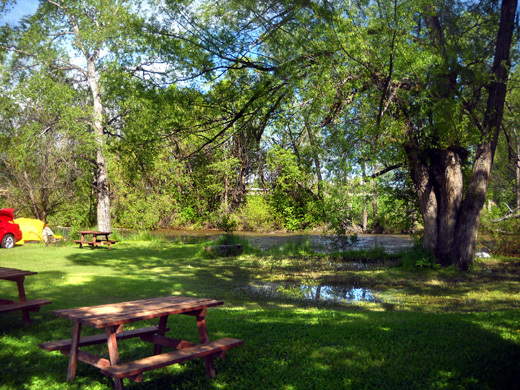 The campground has perhaps 600 feet of river frontage, Scott Park almost half a mile. 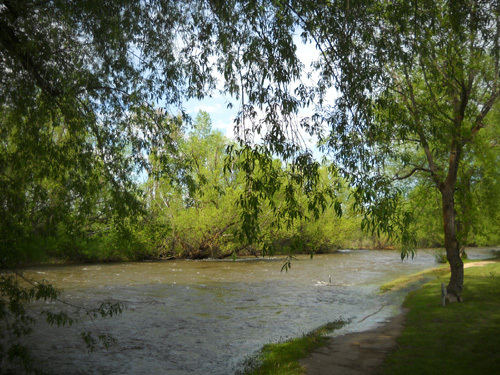 The Hoods' property is currently faring better than the trail and turf next to the river in the park. 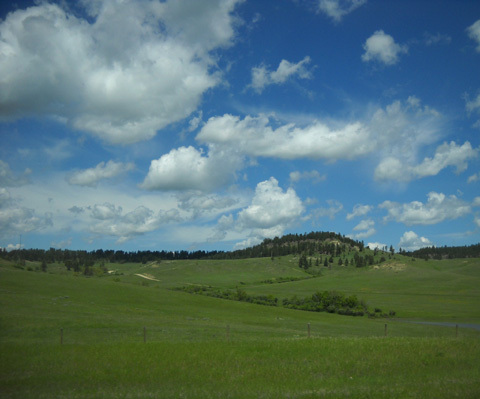 The Bighorn race course traditionally follows the fence line on the park side. When the path gets within a couple feet of the river bank, it turns to follow the river. The finish line is 200-300 feet past that turn, near one of the picnic shelters. The river is the highest we've ever seen it and running very, very fast. 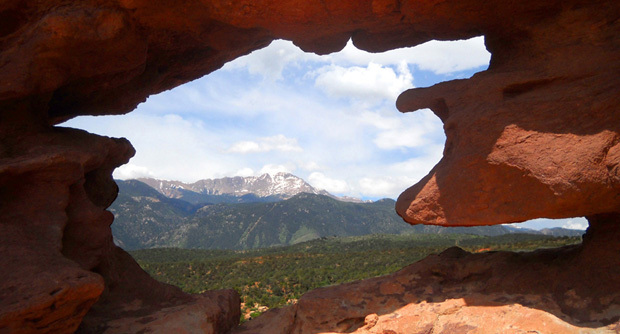 It usually peaks during the night in Dayton, after each day's snowmelt drains down from the nearby mountains, through the canyon, and into the valley below. If I was in that tent, I'd move it farther away from the river! I'm not worried about the ground around our camper flooding right now, but the tent area is vulnerable every night when the occupants are sleeping and have no clue about water levels. Note the pools of water in the grass between the shelter and where I'm standing. That's where all the finish line festivities are usually located. Some adjustments will obviously have to be made this weekend. I was able to get yesterday's photos by detouring around the flooded or eroded sections until I got to the bridging over the wetland area at the far end of the trail loop. I've seen trail erosion from high water in Scott Park before. Crews at some point have put plastic under the sandy soil used on the trail to try to reduce the damage. Their efforts have been pretty much for naught this spring. 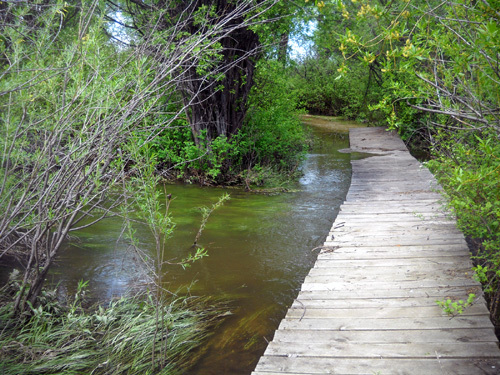 Not only are parts of the trail underwater, the current has been strong enough to rip much of the plastic and sand out and either dump the sand on nearby grass or carry it downstream. I retraced my steps, went around the other (higher) side of the loop farther inland, and approached the boardwalk from that side. Same story. And the water is obviously higher today than yesterday. I didn't go back the trail today. All this makes me curious about what will happen in the next few days. 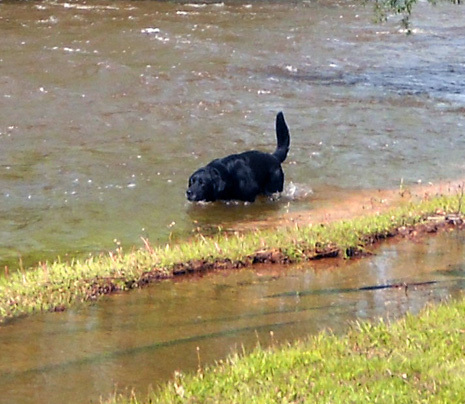 Residents who live along the river have plenty to be concerned about. 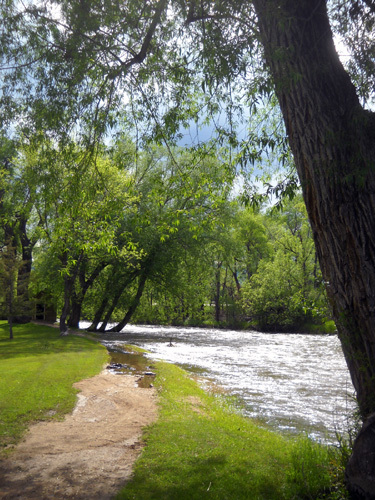 On a bike ride I could see where water has flowed through several yards a quarter mile upstream from the campground. There's a spot on the Tongue Canyon Road with a high-water line in the road. This has got to affect the finish of the Bighorn races -- if not on that road, most definitely in the park unless the water recedes by Friday. That's the day the 100-mile race begins and the finish area will be set up. 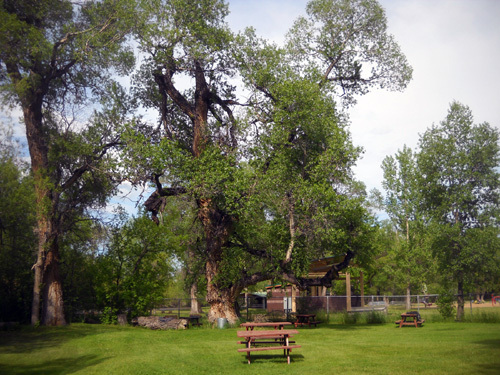 The traditional Bighorn finish line is right near this tree. This is only one small part of the course re-routing that is necessary to pull off the trail races this year. 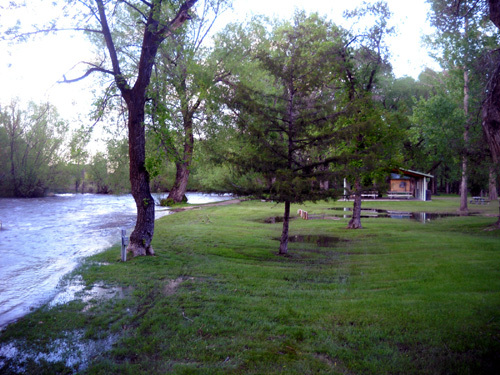 Now that we're here I'm less concerned about flooding in our part of the campground. It's only a few feet higher than the river but we should have adequate warning if it creeps toward us. The good thing is that there are no dams upstream along the Tongue River that could suddenly break and wreak havoc in Dayton.